Besides Christmas, Good Friday, and Easter, Advent is probably the most widely celebrated Christian season – or is it? As the weather gets colder, and the snow finally sticks to the ground, our thoughts turn to… Advent? Each year on November 1st (Canadian storekeepers seem to feel that they can leap over Rememberance Day straight to Christmas – orange and black come down and red and green go up), the glitz, glitter, and glorias break out in every store. Every piped-in song contains the tuneless rhythm of “jingle bells,” and every available retail space is crammed with tinsle, trees, lights, and the latest Christmas trend (this year it seems to be “shoe ornaments”). The commercial world wants us to skip right past any sense of waiting and run full steam ahead for the holiday of holidays: Christmas. I’m not about to compare churches to retail frenzies (although in some cases there are, perhaps, comparisons to be made). What I am about to do is to bemoan the fact that the church, too, hops directly over Advent and into Christmas. For most churches, especially those that don’t follow the habits and traditions of the liturgical year, when we decorate the church three to four weeks before Christmas we are beginning a long-drawn-out celebration of Christmas, rather than beginning the season of Advent. We put up our trees and lights. We start singing Christmas carols. We begin (sometimes) hearing sermons about Christmas. It’s not that there’s anything wrong with any of these activities. It’s just that there’s something missing. Christmas is a season of triumph and joy. We rejoice in the coming of our King; we rejoice in the knowledge that God lowered himself, and took the position of a human baby so that we might know him better. 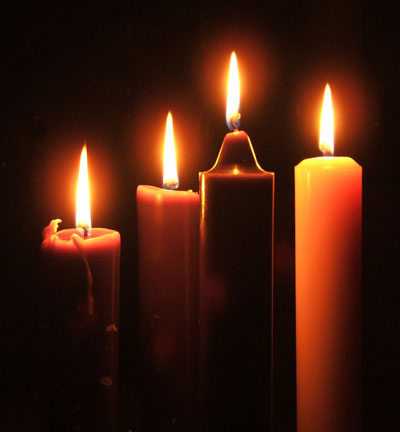 Advent, by contrast, is a time of sober reflection and preparation. Advent is the experience of waiting with Israel for the Christ – and waiting together as the church for the second coming of Jesus. It’s the fast that makes the feast taste extra good. What are we missing when we skip over Advent? Christmas contains none of this longing, and rightly so. Christmas is pure celebration of the fact that Christ has come – but our celebration will ring false if we don’t first acknowledge, through Advent, that we desperately need him to come again. Thank you for your reminder of the importance of waiting and longing. Indeed, we need Him to come. I just ordered an advent wreath from Ann Voskamp’s son (she’s a Canadian blogger/writer) and have my Regent Advent Reader ready to go for myself and my prayer partner – and am going to use Mrs. Voskamp’s Advent/Jesse Tree plan for the kids this year. We didn’t grow up with the liturgical calendar, and I have LOVED the opportunity to wait with my children. Thank you for sharing, I blog thoughts, you blog truth! Thank you! I so appreciated your description of what Advent is. I have always equated Advent with Christmas and all that entails in North America. Each mass, when it was announced that it was the first Sunday of Advent, I would sigh deeply and look forward to the first Sunday of Ordinary Time. Try wishing Merry Christmas to someone on Boxing Day – they look so confused. Even more confusion comes if you try it on New Year’s Day. Few people realize the 12 days of Christmas actually begin Christmas day and last until Epiphany on January 6. How would our worship change if we lived into the waiting of Advent and the full celebration of Christmas?